European markets ended Tuesday's session in the red with the German DAX dropping 0.4% as traders remained focused on US-China trade tensions and regional politics. 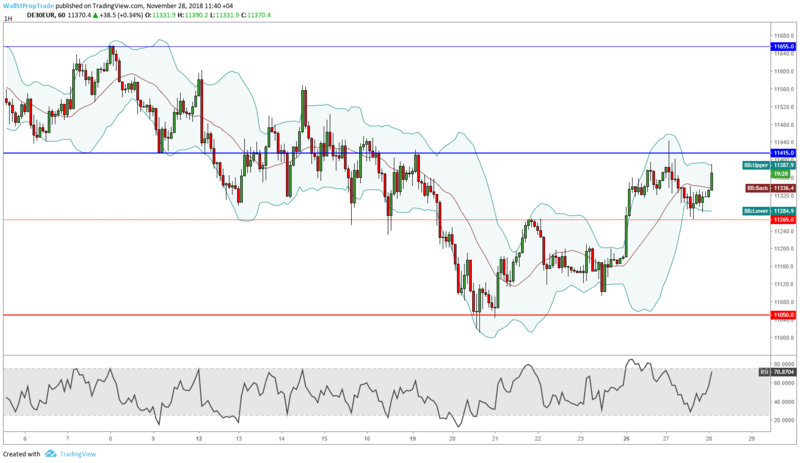 Today however, German stocks may open slightly higher following the optimism on Wall Street last night after Larry Kudlow's positive comments concerning the US-Sino talks. On an otherwise light Wednesday for European economics, the highlights are the release of the latest Financial Stability Report and bank stress test results from the Bank of England and the German consumer confidence data. The DAX ran into sellers again yesterday around 11415, finishing the day at 11310 after loosing €45. In a volatile session, prices traded above the prior day's high as well as below the previous day's low, forming a bearish Engulfing Candle. Additionally, prices are trading close to the key technical support level at 11265 and the stock index might ran into buyers today around that level. The RSI looks bullish so far signaling a strong upward momentum for the next few hours.